At the age of 29 when this piece debuted, Caillebotte was the youngin' of the Impressionist scene. He worshipped artists such as Monet and Manet and bought and collected a lot of their works, to the point that when he died and donated his collection to the French nation, it later made up most of what is now the Musée d’Orsay. Upon closer observation however, you may say that this painting doesn’t look Impressionist at all. And you would be right. This painting is a lot more finished than the quick, sketch-like paintings of the classic Impressionist movement. You can see the inspiration from photography in this work with the cropping and the focus in the forefront, lack of focus in the background. It also has that snapshot, live-in-the-moment vibe with the people mid-step and looking off in the distance. However, it does align with Impressionist style in terms of subject and his focus on light. 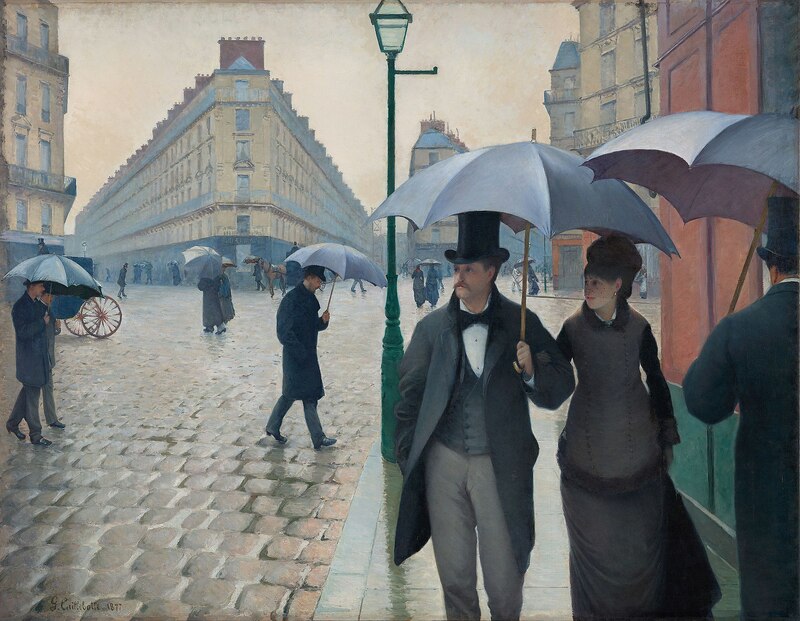 Honestly, Caillebotte could do whatever he wanted because he basically kept the movement alive with his patronage. The street depicted here is still around. It’s the intersection near Saint-Lazare train station, for those of you who are familiar with Parisian geography. It was a new street at the time that this painting was created. Baron Haussmann (who wasn’t actually a baron but had delusions of grandeur and a knack for city planning so people just went along with it) started remodeling Paris, getting it ready for the onslaught of capitalism that was upon them. This painting is a representation of the new Paris, where you could roam the newly lit streets and hire all the prostitutes your heart desired. Vive la France! Paris Street; Rainy Day (French: Rue de Paris, temps de pluie) is a large 1877 oil painting by the French artist Gustave Caillebotte (1848–1894), and is his best known work. It shows a number of individuals walking through the Place de Dublin, then known as the Carrefour de Moscou, at an intersection to the east of the Gare Saint-Lazare in north Paris. Although Caillebotte was a friend and patron of many of the impressionist painters, and this work is part of that school, it differs in its realism and reliance on line rather than broad brush strokes. Caillebotte's interest in photography is evident. The figures in the foreground appear "out of focus", those in the mid-distance (the carriage and the pedestrians in the intersection) have sharp edges, while the features in the background become progressively indistinct. The severe cropping of some figures –particularly the man to the far right– further suggests the influence of photography. The painting was first shown at the Third Impressionist Exhibition of 1877. It is currently owned by the Art Institute of Chicago.AIC curator Gloria Groom described the work as "the great picture of urban life in the late 19th century." Check out the full Wikipedia article about Paris Street; Rainy Day.